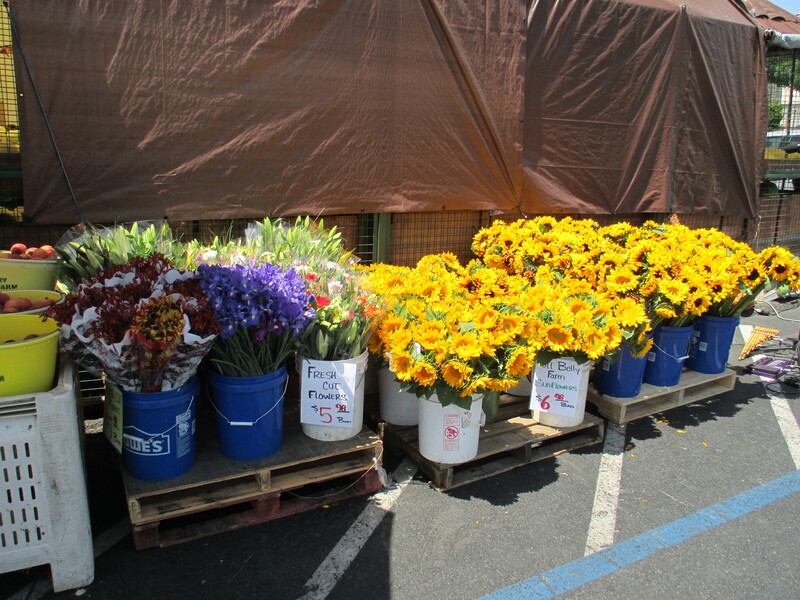 Tubs of flowers at the Monterey Market. Even walking past them makes the heart glad. I’m trying to think of how this fits in with either Phyllis Diller or wine, but it doesn’t. Rats. But it’s too much fun to let it go. Back on Shattuck Avenue is The Cheese Board, a cheese co-op/bakery which reminds me of the old butcher shop with the long counter and all the wares on display behind the shiny curved glass. The Cheese Board has hundred of cheeses and they give samples. For those of us who have a hard time making decisions, it’s a little bite of heaven. “What would you like to try?” the man behind the counter asks. We walk 8 feet down to where the blue cheeses are displayed. “Something not too sharp,” I add. He cuts a tiny sliver off one of the scores of cheeses. “A little salty,” I say, and he says, “try this one,” and slivers off another tiny taste of a cheese wedge. 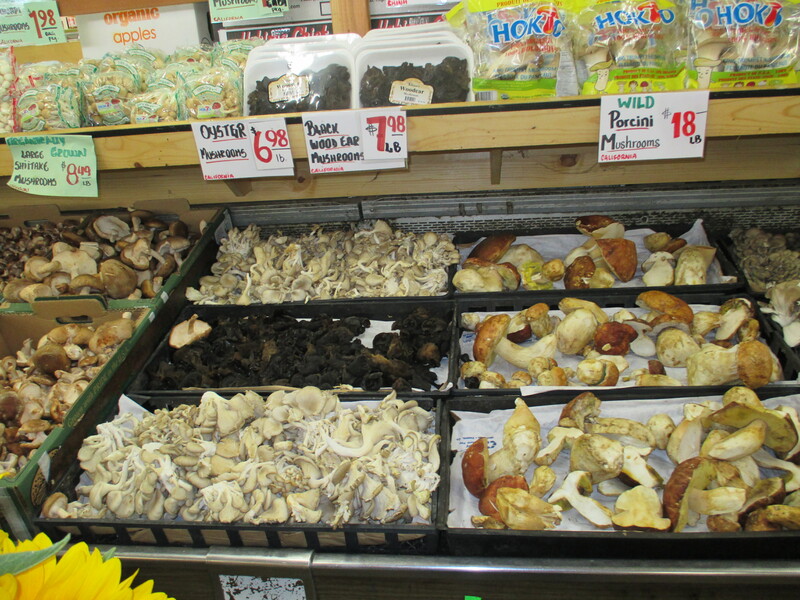 Now on to the Monterey Market to gather some mushrooms! The Monterey Market is far and away my favorite haunt in Berkeley. It’s actually, I think, in Albany — slightly farther north. Never mind — it’s an adventure and I love it. They have the most unusual, divine food ever, mainly produce from local farms. And the mushrooms! Oh. My. Gosh. Mushrooms of a sort that most people have never heard of. At least not people who live where I live. Perhaps people who live in a university town are used to these multiple choices. And are they expensive? Um, yes. BUT, mushrooms don’t weigh much so even the ones that are $15 or more a pound really aren’t all that expensive considering you’re only going to buy a couple of ounces. And now you’re going to ask me what KIND of mushrooms these are. I can only tell you they are delicious. Whoever heard of these black elephant ear thingies? Or the cute little hen-and-chicks. You know they’re going to be great. “Oooh, fresh morels!” The lady next to me grabs a bag and gently begins loading it with the small black mushrooms. “They’re picked locally, you know,” she confides in me, (I didn’t) and you can only get the fresh ones in May.” Well, I gotta have some of those for sure. don’t these look like fun? The rest of these, I’m clueless. Sure I’ve heard of Shitake and even Oyster mushrooms, but the rest of these are all new to me. I think I could move to Berkeley just to be near the Monterey Market. When I got home, I sauteed them in butter and put them over omelets. With mushrooms like these, who needs bacon? And once again, you’ve made me homesick for Berkeley and the Bay Area.